Few things spark a motorcyclist's imagination like finding a forgotten old motorcycle rusting away under a tree someplace. It's impossible not to think what it would be like to make it run again. "Glory Hallelujah! I found what I was looking for. Ecce moto! 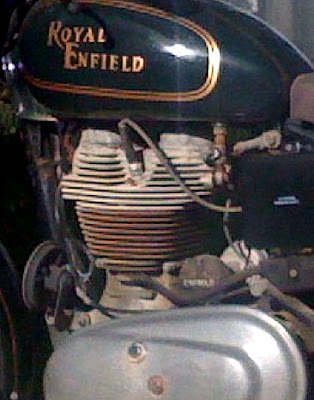 It’s an old iron barrel Royal Enfield Bullet 500, the classic type, no frills." 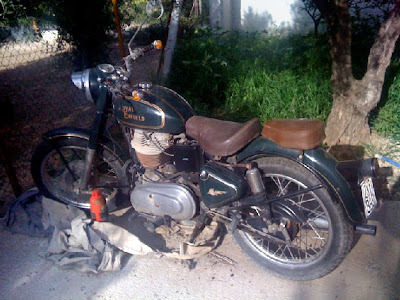 Luc has blogged about his search for a Royal Enfield. He had been focusing on a recent model, the Electra, but a couple of failed attempts to find one used apparently left him open to the idea of bringing this older Classic back into service. 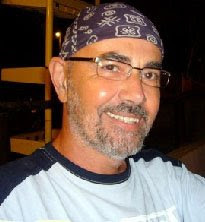 A native of Belgium now living on Crete, Luc has started a blog for the project. Luc says the bike has 35,000 kilometers on it. His pictures show some intersting accessories like single seat and pillion pad, and bar-end turn signals. My eye immediately noticed the left-side shift, which I had thought was only for the United States in that era. Could this be a U.S.-spec bike somehow transported to Crete? Luc says he hadn't been on a motorcycle in 25 years when he took a test ride last year on a new Royal Enfield. So far, he hasn't got so much as an owner's manual for his restoration project on this one. It will be interesting watching how he fares. Interesting and stylish blog, just seems to run a bit slow on my PC. I have a Bullet Classic in Red, just like the other one in his pictures. Worth a look at the blog. Great accent over the e!